There can be no complacency when the Galway senior hurlers travel up the motorway to take on Clare in Croke Park in the All-Ireland semi-final on Saturday (5pm ). After their superb display, especially the first half, of the replayed Leinster final against Kilkenny in Thurles, Micheál Donoghue's squad is tipped by most pundits as probable All-Ireland champions again in a few weeks time. However, the experienced players on the Galway panel will remember harsh defeats in the past when they were expected in many quarters to prevail. They and the management team should be able to ensure loose predictions of ultimate success are not allowed to seep into the subconscious of any of the players on the panel. Thinking too far ahead in sport is a dangerous thing to do. However, Micheál Donoghue and his management team's logic of taking one game at a time has served them well, and that is the approach they will taking this week too. The prize at stake on Saturday evening is huge, and both teams will be going hammer and tong to try to produce a performance that will see them in Croke Park on All-Ireland final day. Clare were last All-Ireland champions in 2013 and the Banner men beat Galway by 1-23 to 2-14 that year in the All-Ireland quarter-final in Thurles. They defeated Cork after a replay in the final, with Shane O'Donnell scoring a phenomenal 3-3 to see them home by 5-16 to 3-16. From that Clare team, key forwards Tony Kelly, Podge Collins, Shane O'Donnell and John Conlon are still in situ and they will require careful minding this weekend by Galway defenders, such as Gearoid McInerney, Adrian Tuohey, John Hanbury, Daithí Burke and the in-form Padraig Mannion. Galway supporters will be hoping their team's forwards will have too much fire-power for a Clare defence that conceded 2-24 to Cork in the Munster final. Clare led by eight points in that game and their subsequent collapse to the Rebels in the second half will be a cause of concern for Gerry O'Connor and Donal Moloney. If Cathal Mannion, Joe Canning, Conor Whelan and Johnny Glynn can repeat their top-class form from the Leinster final replay, with strong support over the 75 minutes from other Galway forwards, such as Joseph Cooney, Conor Cooney, Jason Flynn and Niall Burke, then Galway will hopefully have too much up front for the Clare defence. An area that will be a big factor in deciding Saturday evening's contest is midfield, and here David Burke and Johnny Coen will be expected to again bring their Leinster final replay form to the table and produce big displays, having been inconspicuous in the drawn game. David is team captain and a four times All-Star. 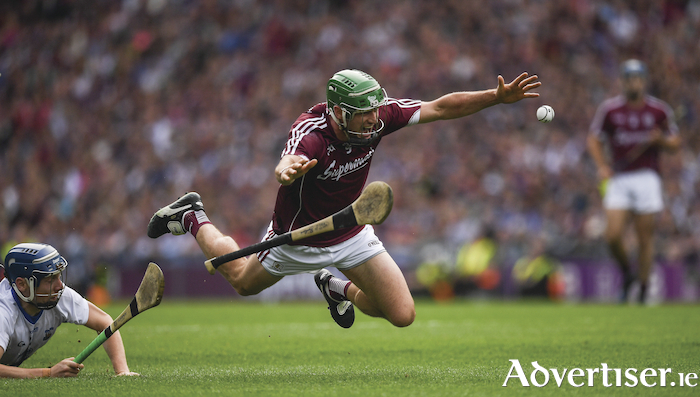 When he plays well and leads the Galway charge from around the middle, he can be inspirational for those around him. Big performances by those two in the engine room would provide a real platform for a Galway win as it is very hard to see the Clare defence holding the Galway forwards if they get good supply. Clare beat Wexford by 0-27 to 1-17 in the All-Ireland quarter-final and got that job done, but it was not a display to set the pulses racing. They have some superb individual players such as Tony Kelly, but in the final analysis, based on both teams respective form over the past month, and Galway's great range of potential scorers up front, it is realistic to predict a win for Galway.